Orange has confirmed to TechRadar that it will have the Samsung Galaxy Tab from 'early November'. The network always looked a likely to candidate to offer up the Tab when it launches on 1 November, but Orange has confirmed that this is the case. "We can confirm we are planning to range the Galaxy Tab in early November," said a spokesperson. "More details on pricing and availability, which have yet to be announced, will be made nearer the time." Nearer the time would be in a matter of days, of course, with the eagerly-anticipated 7-inch Android tablet closing in its high-profile debut. The Tab is expected to cost around the same as the iPad when it does arrive, but it will be interesting to see what price the networks can get the tablet down to with the various contract that they offer. O2 are also among the stockists, as are Carphone Warehouse and Vodafone. 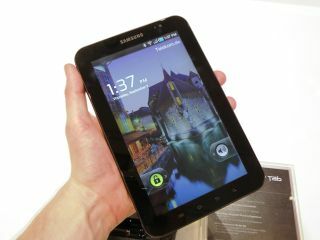 The Galaxy Tab runs Android 2.2, weighs in at 380g and the size is supposed to make the tablet more friendly to the pocket. But the form-factor has already been criticised by Apple supreme Steve Jobs – who suggested that 7 inch tablets were already dead in the water.